If your work environment is like ours here at SAS, you're seeing more of your data and applications move to the cloud. It's not yet a complete replacement for having local files on your desktop machine, but with cloud storage and apps -- like Microsoft OneDrive -- I can now access my work documents from any browser and any device, including my smartphone. I can update now my spreadsheets while waiting in the dentist office. Oh joy. For those of us who use SAS to read and create Microsoft Excel documents, cloud-based files can add an extra wrinkle when we automate the process. It also adds some exciting possibilities! The Microsoft Office 365 suite offers APIs to discover, fetch, and update our documents using code. 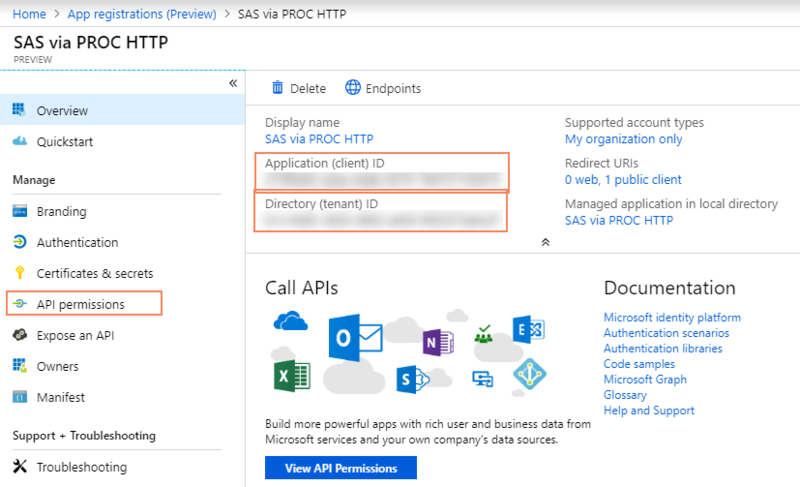 In this article, I'll show you how to use SAS programs to reach into your Microsoft OneDrive cloud to read and update your files. Note: All of this assumes that you already have a Microsoft Office 365 account -- perhaps provisioned by your IT support team -- and that you're using it to manage your documents. Before I go on, I have to give major credit to Joseph Henry, the SAS developer who maintains PROC HTTP. Joseph did the heavy lifting for putting together the code and examples in this article. He also regularly adds new features to PROC HTTP that make it a more natural fit for calling REST APIs that require special authentication flows, such as OAuth2. 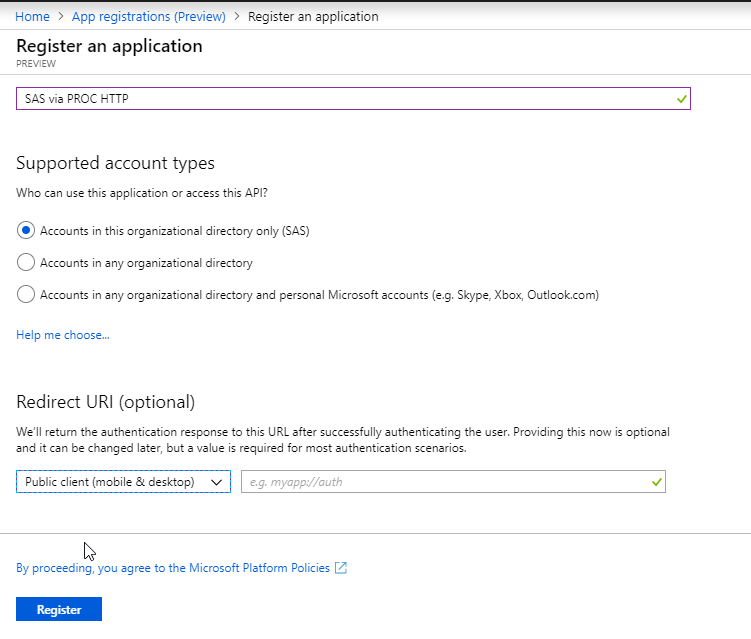 Microsoft Office 365 uses an OAuth2-style authentication flow to grant access and permissions to third-party apps. If you're accustomed to the simpler style of just user/password authentication (ah, those were the days), OAuth2 can be intimidating. Joseph Henry does a great job of deconstructing OAuth2 -- with code samples -- in this SAS Global Forum paper. Using your browser while you are signed into Office 365, navigate to a special web address to obtain an authorization code for your application. With your authorization code in hand, plug this into a SAS program (PROC HTTP step) to retrieve an OAuth2 access token (and a refresh token). 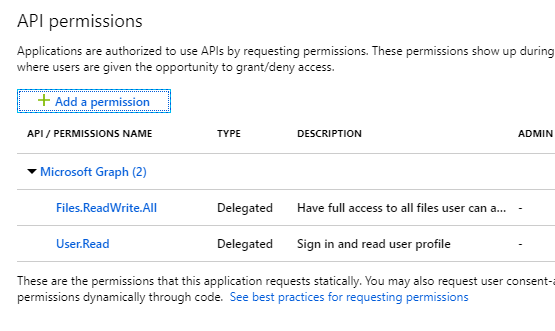 With the access token, you can now use PROC HTTP and the Microsoft Office 365 APIs to retrieve your OneDrive folders and files, download files, upload files, and replace files. You'll have to complete Step 1 just once for your application or project. Steps 2 and 3 can be done just once, or at least just occasionally. The access token is valid for a limited time (usually 1 hour), but you can always exchange the refresh token for a new valid access token. This refresh token step can be automated in your program, usually run just once per session. Occasionally that refresh token can be revoked (and thus made invalid) when certain events occur (such as you changing your account password). When that happens, you'll need to repeat steps 2 and 3 to get a new set of access/refresh tokens. Oh, and by the way, even though the examples in this article are specific to OneDrive, the exact same authentication flow and steps can be used for all of the Microsoft Office 365 APIs. Have fun with Outlook, Teams, Excel, and all of your favorite cloud-based Microsoft apps. Visit the Microsoft Application Registration portal to register your new app. You'll sign in with your Microsoft Office 365 credentials. Note: At the time of this writing, Microsoft was testing a new web experience for application developers. I opted for the "preview experience" with the hope that my screenshots would have a longer shelf life for future readers. Click New Registration to get started. This presents you with a form where you can complete the details that define your app. Mainly, you're giving it a name and defining its scope. You'll probably want to limit its use to just your organization (your company) unless you're collaborating with colleagues who work elsewhere. Files.ReadWrite.All: Allows the app to read, create, update and delete all files that you can access. User.Read: Allows you to sign in to the app with your organizational account and let the app read your profile. To add these to your app, click the API Permissions tab in the control center. To be clear, these are not permissions that your app will automatically have. These are the permissions that will be requested when you "sign into" the app for the first time, and that you'll have to agree to in order for the app to run. There are a few app-specific values that we'll need to reference throughout the SAS programs we're writing. I decided to create a configuration file for these settings rather than hard-code them into my SAS statements. This will make it easier for other people to reuse my code in their own applications. 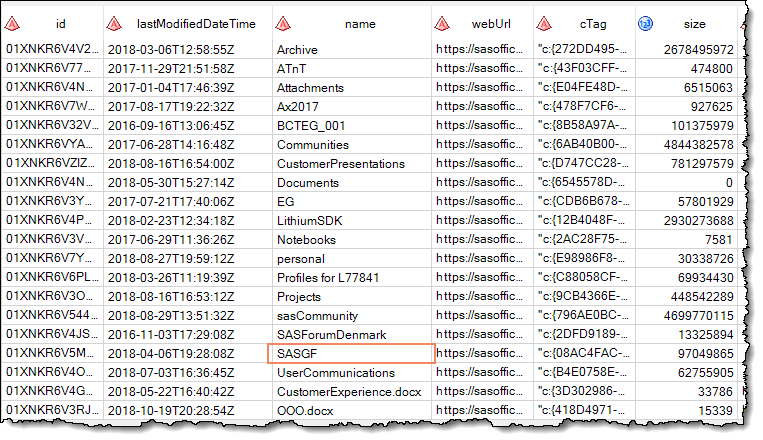 By "externalizing" the IDs specific to my account/instance, I can use SAS code to read the values at run time. Note: This code, like all of the code in this article, uses features from SAS 9.4 Maintenance 5.
are easy to adapt for different users or projects. Now that I've defined the application, it's time to "sign into it" and grant it the permission to read and manage content in OneDrive. This step needs to be completed from a web browser while I am signed into my Microsoft Office 365 account. The web address is very long...but we can use a SAS program to generate it for us. Copy the value that appears after the code= in the URL, only up to the &session= part. It's going to be a very long string -- over 700 characters. We'll need that value for the next step. %get_token - get the initial access and refresh tokens, given an authorization code. Remember, an access token will expire in about 60 minutes. But the refresh token can be used to get a renewed access token. %process_token_file - read/update an external token file so that these values persist beyond your current SAS session. I'm not going to walk through the macro code in this article, but the SAS programs are straightforward and well-documented. See "How to get this example code" at the end of this article. With these macros in place, we can paste the (very long) authorization code we retrieved in the previous step into a macro variable. Then we can run the %get_token macro to generate the tokens and store them in a local file. It's very important that you keep this file secure. With the information in this file (your refresh token) and your conf.json file (with your client ID and tenant ID), anyone can use these code techniques to impersonate you and access your Microsoft Office 365 data. There are techniques for storing these files such that only you can see them. From the screenshots I've shared, you probably already noticed that these services are working on Microsoft Azure, which is Microsoft's cloud platform for applications. 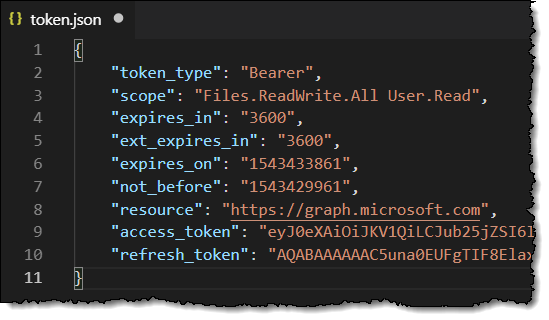 For the remainder of this article, I'll be using methods from the Microsoft Graph API. This REST-based API provides access to almost all of Microsoft's hosted services. For my examples, I'll be using methods within the Files component of the API: Drives and Drive Items (folders and files). Now that we have the access and refresh tokens, we can get down to business with some actual OneDrive interactions. Here's how to initialize your SAS session with the tokens. At this point we have a valid access token and we can start using the API. If all goes well, we'll have our access token, and it will be stored in a macro variable named &access_token. It's going to be another long and illegible (>700 characters) value. We'll need to explore the OneDrive system from the top-down, using code. First, we need the identifier for the root drive. It's possible for you to have multiple root drives, and if that's the case for you, you'll need to modify this code a bit. This code queries the service for your drives, and stores the identifier for just the first drive in a macro variable. We'll need that identifier later to retrieve a list of top-level items. First we need the ID of the "drive" we are going to use. the set with a where clause on the name value. This creates a data set with the one record for the drive. Note that this code uses the new OAUTH_BEARER option in PROC HTTP -- a convenient addition when working with OAuth2-compliant APIs. This is shorthand -- and more intuitive syntax -- for placing "Authorization: Bearer TOKEN-VALUE" in the HTTP headers. With the drive identifier in hand, I can use the /children verb on the Microsoft Graph API to get a list of all of the top-level objects in that drive. These represent the folders and files that are at the root. Here's what I'm keeping in my OneDrive right now. It's not too disorganized, is it? If I'm interested in exploring a particular folder, I'll need to find the folder identifier as it's known to OneDrive. Using PROC SQL and SELECT INTO, I can find the folder by its name and store its ID in another macro variable. Then, I use the /children verb again, but this time with the folder ID instead of the "root" constant. At this point, if you want to act on any of the items, you just replace "root"
which might include other folders. Here are the items from my SASGF folder. Can you tell that I don't throw anything away? I know that I keep a spreadsheet named "sas_tech_talks_18.xlsx" in this SASGF folder. With the /content verb, I can download the file from OneDrive and store it in the file system that is local to my SAS session. Then, I can use PROC IMPORT to read it into a SAS data set. Boom! I've just downloaded my data from the cloud and brought it into my SAS session. This returns a json response that describes the item uploaded. This step pulls out the main file attributes from that response. If you want to replace an existing file, then you'll want to perform the additional step of retrieving the unique ID for that file from OneDrive. When you PUT the new version of the file into place, its history and sharing properties should remain intact. Here is my code for navigating the folder/file structure in my OneDrive and finally replacing an existing file. and history could be lost. As you can see from my OneDrive history for this file, I've tested this program a few times -- resulting in 23 revisions of this file in its history! You can find the source files for these examples on GitHub. onedrive_config.sas - read the fields from the conf.json and set them as global macro variables. This includes your client_id and tenant_id. onedrive_setup.sas - the SAS statements that represent code you will need to run just once to get your authorization code and first access code. 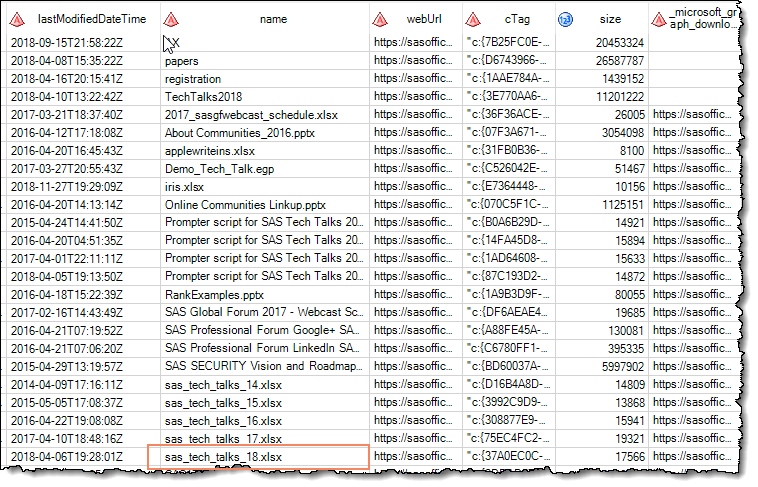 onedrive_example_use.sas - sample SAS steps that I used in this article. They won't quite work for you as-is, since you don't have the same files that I do. (Unless you do have the same files, in which case...creepy.) My hope is that you can read and adapt them for your own content. I also included a template for the conf.json file, with obvious placeholders for the client_id and tenant_id that you'll substitute with your own values. You'll also need to change the statements that define &CONFIG_LOC -- the location of your configuration directory where you're storing these files. I developed these examples in SAS University Edition -- yes, this works there! I also ran the code from my full SAS environment via SAS Enterprise Guide. This has been a monster article -- in terms of its length. But I hope it's clear enough to follow and has sufficient detail for you to try this on your own. If you have questions, post in the comments. Thank you so much for this very interesting post. I wonder if it is possible to make a short video tutorial. The step 1 was not straightforward for me. I think a video tutorial could be very helpful. We are still on SAS 9.3 running on Unix. Will this work with that setup? The the techniques can work, but you'll need to retrofit some of the code. The PROC HTTP options are one small hurdle, but the biggest trick will be in dealing with the JSON responses. The JSON libname engine in SAS 9.4 makes this so easy. SAS via PROC HTTP needs permission to access resources in your organization that only an admin can grant. Please ask an admin to grant permission to this app before you can use it. 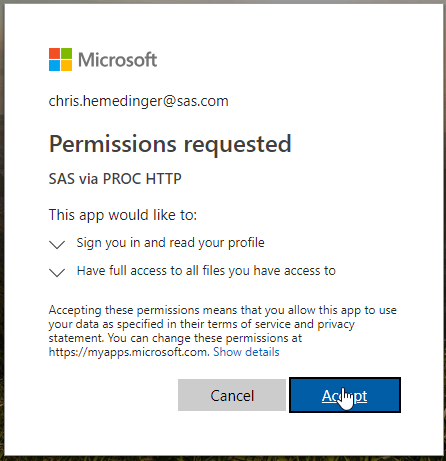 Are you trying to use *my* app named "SAS via PROC HTTP"? You won't be able to do that. You need to follow the steps to create your own app to get the client ID, etc. And in my org, it appears that anyone can create an app. But this might be a capability that Office 365 admins can restrict/control. Yes, maybe in my organization group it needs admin permission, and also may be in your side, you have already been given admin permission. In step "Copy and paste the URL (all on one line, no spaces) into the address bar of your web browser. 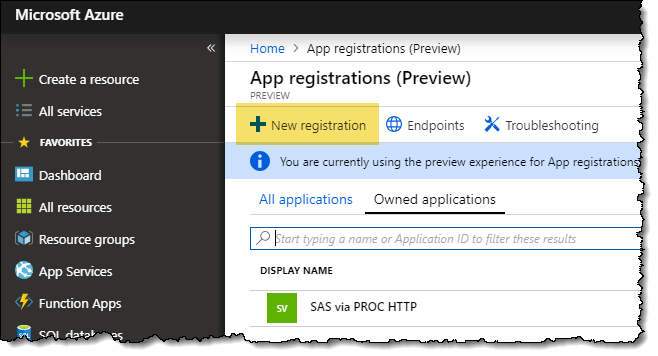 When you press Enter, you'll be prompted to grant the required permissions:" , when I use IE to access the URL, it said "SAS via PROC HTTP needs permission to access resources in your organization that only an admin can grant. Please ask an admin to grant permission to this app before you can use it." Step 1 "I created a file named conf.json"
Yes - good catch! I've fixed it. I just wanted to say thanks for a well written and detailed blog on this. I've used this as a basis to work with a Microsoft Office 365 suite API to get a list of emails and retrieve email content. It took a bit to get the auth token sorted, but after that it was relatively straight forward to use. I also used the json libname engine so that I could work with the response as if they were SAS tables. Thank you for such an elaborate post. this is really helpful. Is there a code to create an empty folder before copying over the file ? For creating new folders with SAS, I use the DLCREATEDIR trick all of the time. If you're looking to create a new folder in OneDrive, you would use this method on the "children" element of the OneDrive API.